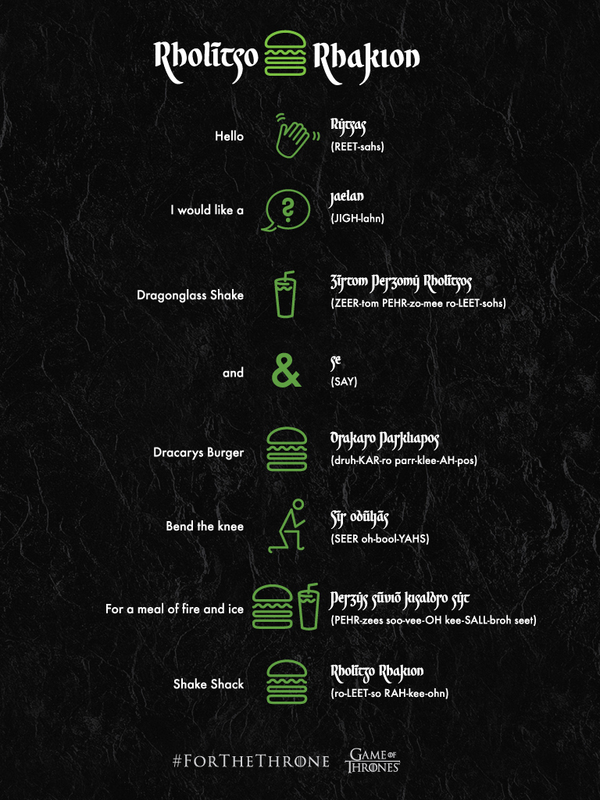 Starting April 12, fans can grab a Dracarys Burger and Dragonglass Shake just in time for the GoT premiere—but only if they order in Valyrian. On April 14, Game of Thrones fans will be one step closer to (finally) finding out the fate of their favorite characters, now that winter is here—and as it turns out, Shake Shack is just as hyped up as the rest of us. 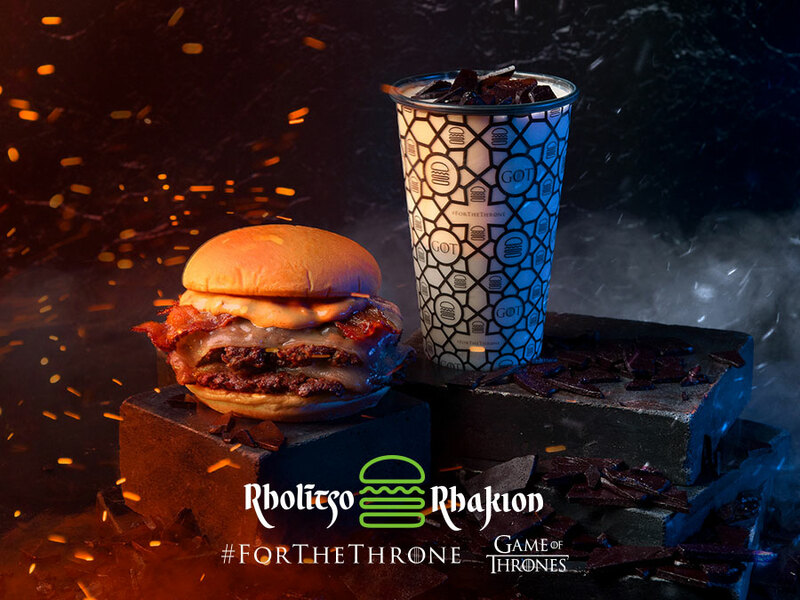 Last week, the burger chain announced that its Innovation Kitchen had developed a secret Game of Thrones menu inspired by fire and ice, with a Dracarys Burger and Dragonglass Shake that definitely, unashamedly made us geek out when we tried them. The items were previously exclusive to the Madison Square Park location in New York; however, Shake Shack announced on Thursday that the secret menu is conquering (sorry, launching) nationwide on April 12, so everyone can grab the shakes and burgers before the final season premiere. The shake (suggested retail price $6.49) will be available at all Shacks nationwide excluding stadiums, ballparks, airports, and transit centers through May 19, according to a statement. As for the burger (SRP $10.99), you’ll find it at select locations through April 21 in the following cities: New York, Los Angeles, Chicago, Dallas, Houston, Washington D.C., Miami, Las Vegas, Denver, Philly, and Boston. New York's West Village Shake Shack, in addition to serving the special menu, will also have a Dragonstone Throne on location on April 12—naturally, photo opps are available, and you can RSVP to take the throne . (Just don’t tell Daenerys). In other Game of Thrones food news, we rounded up all of the food and beverage tributes we’ve seen so far for the final season. Not in the mood for a burger? Grab the special edition Game of Thrones Oreos, stamped with sigils from the three warring houses: Stark, Targaryen, and Lannister (plus the Night King, in case you like anti-heroes). Want to toast season eight with a cocktail? Johhnie Walker has a special-edition “White Walker” whisky on the market, which reveals a hidden design when it’s chilled. There’s also a pretzel Iron Throne replica, a dragon made out of Peeps, and Mountain Dews honoring Arya Stark and her iconic kill list—check them all out here.